The first (excellent) season of My Teen Romantic Comedy SNAFU was two parts cynical comedy, one part drama. Season two is the exact opposite—and an anime that reminded me so much of my own high school existence, I often felt ill with remembered embarrassment. In the first season, cynical loner Hachiman is forced to join his high school’s “service club” –basically a club that helps other students complete various tasks. Also part of the club are Yukino, a girl who is as beautiful as she is no-nonsense, and Yui, a girl known to go with the flow (who looks up to the independent natures of the other two). The three do everything from proofread a student’s first novel to design a wedding magazine for high schoolers—solving these problems with a healthy amount of comedy and cynicism. So despite his self-imposed loner status, Hachiman begins to feel a connection with the other two. And in the season’s climax, he decides to help the exhausted Yukino by playing the role of the villain—shaming his schoolmates into helping her. And while Yukino, Yui, and those he previously helped know why he did what he did, his actions cause him to go from non-existent in the school’s hierarchy to the most despised student in the school. By acting the villain, Hachiman was able to help those he has come to care about. With the start of the second season, we see the logical progression that comes from this. Now, instead of just solving problems in a cynical manner, he solves all problems by playing the villain and martyring himself—redirecting emotional damage from the service club client onto himself. And while it does achieve the hoped-for results, what Hachiman fails to realize is that, while he may be able to take it, his actions also hurt those who care for him. This causes a rift between Hachiman, Yukino, and Yui—and one that only deepens even as Hachiman tries to bridge the gap. What the three realize is that, the closer they are, the easier it is for them to hurt one another. And while Yukino and Hachiman have openly mocked the superficial friendships of their schoolmates, they find themselves doing the exact same thing—keeping up the appearance of a friendship but in reality never building a deeper connection for fear of losing what they already have altogether. As Hachiman watches his classmates, he realizes that they too know that their shallow relationships are a lie, but they value them too much to reveal their real selves to each other. At the same time, Hachiman is confronted with old hurts and embarrassments from his past in the form of Kaori, his middle school crush that coldly (and publicly) rejected him—which was, in turn, part of the origin of his cynical personality and lack of desire for any interpersonal relationships. To him, they had been flirting and building a relationship. In her eyes, he was practically a stranger that she talked to sometimes. This cemented in his mind the idea that people never really know one another—so why bother trying. Yet, even after meeting Kaori again and reaffirming that it is impossible to truly get to know a person’s heart, Hachiman decides he still wants to try with Yukino and Yui—that he cares about them both enough to want more than a shallow lie. So in a rambling, tear-filled monologue to the girls, he opens his heart and his desire to develop a deep relationship. What’s brilliant about this scene is that what Hachiman says is in no way as clear cut and easy to understand as I have explained it. Instead it is a mess—a mess by the author’s design. Hachiman is a teen, dealing with a battle between his emotions and intellect. He doesn’t know what he wants—just that he “wants something real.” And that is something that both the girls and we the audience can understand even if Hachiman doesn’t quite have the words to explain it. But as with real-world high school drama, when you are focused on your own, you completely miss what others are going through. While Hachiman is dealing with his whole series of personal revelations, he fails time and again to understand what’s going on with Yukino. In Hachiman’s eyes, Yukino has always been a strong-willed, independent girl. Yet, as the series reaches its climax, she seems on the verge of a breakdown, willing to give up control of her life to Yui. Upon first watch, this seemed confusing—because I, like Hachiman, had been caught up in his drama and had missed what was truly going on with her. Of course, this too is by design. Hachiman is our viewpoint character. 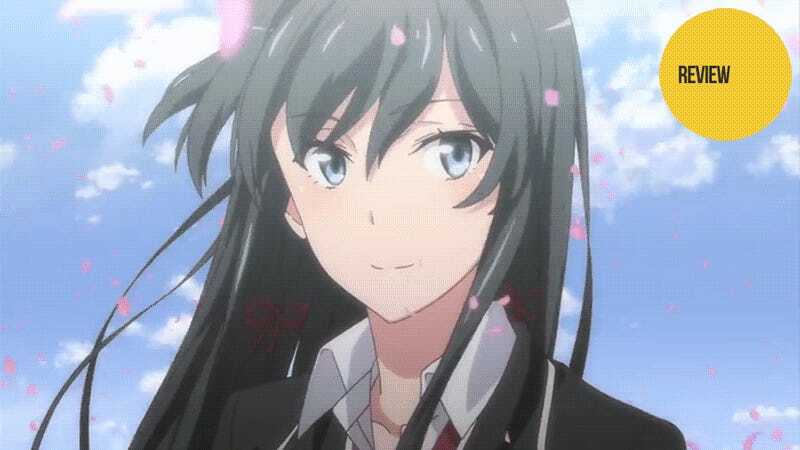 Therefore, we never see Yukino unless Hachiman is present nor are we able to hear her thoughts. Yet, the background is full of hints and clues pertaining to Yukino’s troubled mental state. Yukino is a character attempting to overcome her own extreme case of codependency—i.e., a reliance on other people for approval and identity. As a child, she was the stereotypical “perfect kid.” She did whatever adults told her. At some point in the past, overdependence on what others expected of her clearly hit a tragic climax—likely having to do with her relationship with her childhood friend Hayato. The result left her hating her family in general and her free-willed sister in particular. From that point on, she has struggled to create an identity apart from the expectations of others—living apart from her family and keeping all other people at arm’s length so as not to become dependent on them. This in turn makes her jibes about never being able to be Hachiman’s friend seem a lot less playful. To her, having a friend means once again giving up her own identity. However, despite her attempts to move beyond it, she is still suffering from this dysfunctional behavior. When there is not a clear cut “how you are supposed to react” in a given situation, she becomes confused and panicked—and quick to rely on others. She will also still tend to go along with what any authority figure tells her to the point of self-destruction (as we saw in the first season). This is likely why her sister, an authority figure in her own right, often gives Yukino orders contrary to what other people say—thereby forcing Yukino to make her own choice. But while things seem better than ever before on the outside, what Hachiman doesn’t notice nor understand is that Yukino has had an almost complete relapse into codependency. The choices she makes in her life, even the major ones, are done to please him and Yui. When she announces to Hachiman that she will be following the liberal arts course track for her senior year of high school, he is happy for that means they will spend the next year of classes together. Yet, Yukino’s family’s reaction is immediate. They want her to move back home—or at the least, have her sister move in with her. While Yui and Hachiman think this is strange, over-strict behavior from her family, if you consider her past difficulties, the family’s reaction makes sense. Yukino has switched her school course track—and thus all future plans she had—for no reason other than to make Hachiman and Yui happy. Her family is worried that whatever happened in the past is set to happen again. And they are right to be worried. At this point, Yukino is fully codependent on Hachiman and Yui and unable to make any major choice on her own. Each action she takes is designed to make both of them happy. When given instructions by either, she follows them to the letter—even repeating what she has been told word for word. She knows that her codependency is a problem and feels that, even now, she can’t overcome it. After all, she wants to express her true feelings for Hachiman by giving him the Valentine’s Day cookies she’s been carrying around, but doing so could upset him and/or Yui—so she can’t make herself do it despite her own feelings. It all comes to a climax with Yui’s proposal, that Yukino give up any pretense of a will of her own and let Yui handle everything. This would force Yukino to give up on Hachiman but would also give her the codependent relationship she longs for—namely one where she’s given a clear goal and direction for her life. And she gives in—or rather, tries to. It is only Hachiman’s outright objection to the idea that stops her. He believes, and rightly so, that the only person who should deal with Yukino’s problems is Yukino—that she has to get past her codependency and decide what it is she truly wants to do with her life. It is at this moment she steps back from the precipice, so to speak, and realizes the “real” relationship Hachiman is looking for is not a codependent one, but one of mutual understanding. Moreover, having friends is not the danger in and of itself—giving up her free will as the deciding vote is. It is then that she realizes there is another path: not to ask others to decide for her, but to ask them for their help in figuring out what she should do and then making her own decision. A fine line, but one important in not just Yukino’s life, but our own as well. As I mentioned at the start of the review, while I religiously watched this anime and enjoyed the conflicts both silly and serious, there were many moments in the show that made me feel incredibly, painfully embarrassed. Much of what the characters go through, especially Hachiman, remind me of my own high school life. I was the guy who thought he was making a real emotional connection only to find out it was one sided. I was the one who became cynical, jaded, and over logical—thinking I alone was smart enough to fix everyone’s problems (though in hindsight often making things worse). Yet, at the same time, I was like Yui and clung to the relationships I had, superficial or otherwise, rather than risk true solitude. While I regret nothing of those years (as they helped make me who I am today), I do wish the lessons taught to me could have been more easily learned. However, it’s kind of nice to know that, if this series is anything to go by, my experiences were far more universal than I thought at the time. Through the struggles of Hachiman, Yui, and Yukino, My Teen Romantic Comedy SNAFU TOO! does an amazing job of expressing what high school life actually feels like. Every bit of angst and drama feels like the end of the world while, at the same time, you start to realize the superficiality of day-to-day relationships and wish for more. And as you awaken to all these new thoughts and emotions, you are also expected to decide what to do with your life instead of simply doing as you have been told. It is a unique hell that anyone who has been through high school has experienced. Deep, well-written characters, realistic teen drama, and a multi-layered plot with a strong emotional core make My Teen Romantic Comedy SNAFU TOO! one of the best of the spring season and perhaps the entire year. My Teen Romantic Comedy SNAFU TOO! can be watch for free and with English subtitles in the US at Crunchyroll and Hulu and in Australia on AnimeLab. For a second opinion of this series, check out the review over on Ani-TAY, our user run anime blog.